All the fasteners you need to build a high end performance engine, in one convenient box. • Carb and valve cover studs have thread starter noses for easy assembly. • Intake and header bolts use a reduced size 3/8" head to allow greater access when tightening. • Timing cover and pan bolts have serrated washer faces to resist loosening even with initial startup gasket shrinkage. • Water pump botls for Chevys include both long and short sets. Water pump and timing cover bolts for the 302 Ford include all 19 pieces required. 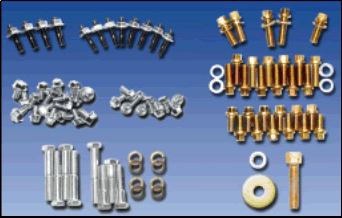 • Balncer bolts are Grade 8 and include a heavy duty load washer and locking washer. 85 ft/lbs using oil, and the 3/8" nuts torqued to 35 ft./lbs.